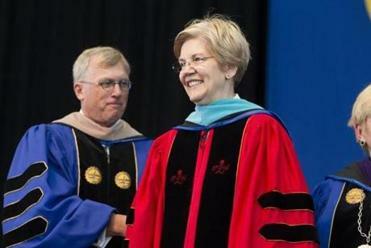 Elizabeth Warren was one of the speakers at Suffolk University’s commencement on Sunday. US Senator Elizabeth Warren on Sunday used examples from her own life to urge graduates of Suffolk University to prepare for the unexpected and fight for the kind of world they want to live in. Speaking at an afternoon ceremony on Boston’s waterfront, Warren told how she dropped out of college, then was forced out of her dream job as a special education teacher because she had a baby. She said no law firms wanted to hire her after she completed law school because she was again pregnant, and told how she began her career as a law professor teaching night classes. Warren went on to describe the unexpected call from then-US Senate Majority Leader Harry Reid asking her to be part of a panel in Washington after the 2008 financial crisis, a development that helped elevate her national profile. “It is a tough world out there and you’re going to encounter roadblocks and setbacks and even people who want you to fail,” Warren told the students. Little mention was made of the tumultuous events of the past semester that roiled the school. To counteract such forces, she told graduates to follow life’s unexpected turns, find their own personal identities, and learn to fight. The Massachusetts Democrat, who has recently sparred in a Twitter war with Republican presidential candidate Donald Trump, drew laughs from the crowd when she jokingly asked Suffolk President Margaret McKenna how her speech was polling in comparison to Trump’s approval ratings. She also got chuckles when she spun the old adage about making lemonade out of lemons into a reference to Beyonce’s recently released album, Lemonade. 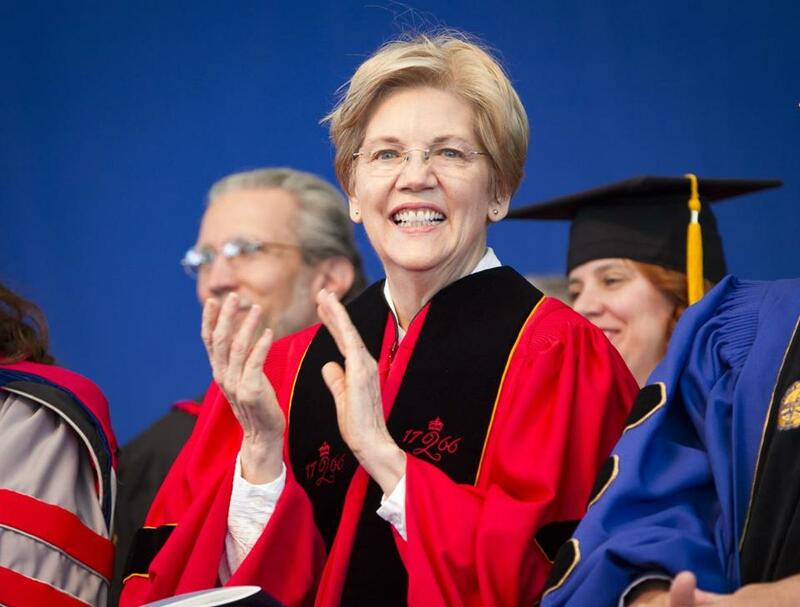 Warren listed some of the most momentous events of her adult life, and said she did not anticipate any of them when she turned her own tassel decades ago. Warren, who received an honorary doctorate, ended her speech with what she said was a piece of advice learned once she became the first female senator from the Bay State.